I was anxious to start making candles! Here at Independence Homestead we try to reuse as many materials as possible, so I had the idea that we could make candles in containers using repurposed glass food jars. We have quite the collection of baby food jars, salsa jars, pasta sauce jars, and more. When melting wax for the candles, I read that it was important not to overheat the wax, so a double boiler was recommended. 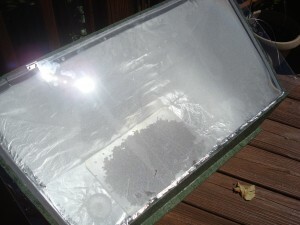 I realized since low heat was best, we should use our solar oven! Solar oven setup on deck, ready to go! 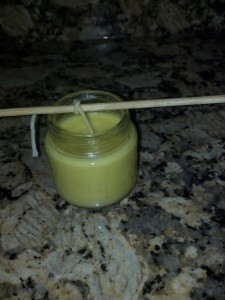 Our candles will be so environmentally friendly! The only new items in them will be the wick and tab, plus solar energy will be used to make them. Plus the beeswax is harvested from our own backyard! For our first candle, I decided to start small. A baby food jar was the perfect size. 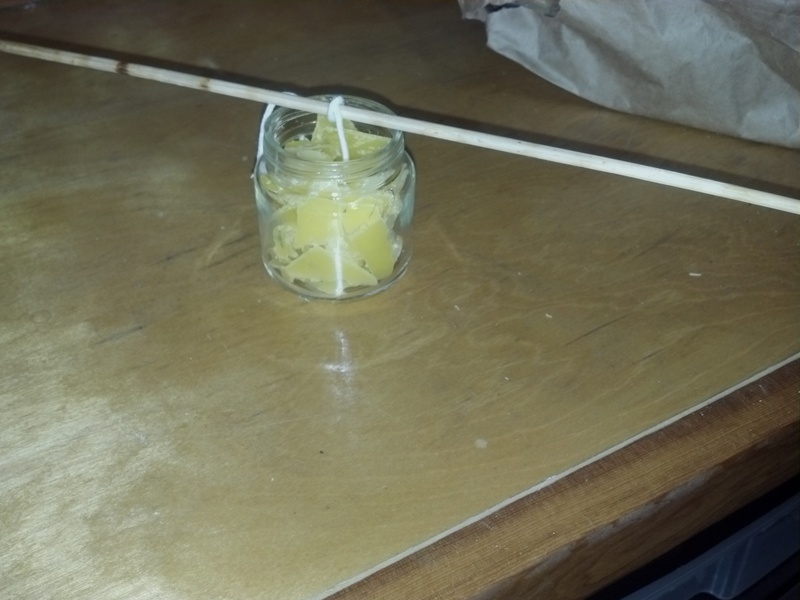 I cut a length of wick that would not only span the depth of the jar, but also have enough to tie around a skewer on the top of the jar, holding the wick straight. I threaded the wick through the tab, tied the other end to the skewer, and set it in the middle of the jar. 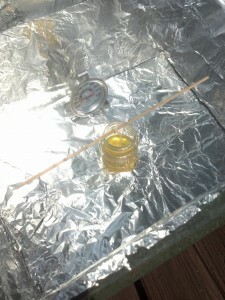 Next I took some of the wax we had melted in the solar oven previously. I broke it into small pieces, and filled the jar with it. The jar then went into the solar oven out on the deck. About an hour later, I went outside to check on the candle’s progress. All of the wax had melted, and the jar was about half full. I brought up more wax, broke it up, and filled the jar again. Another hour went by, and I checked the candle once more. Again the wax had melted, and there was a bit of room left at the top. So once again I filled the jar with pieces of wax, and again they melted and filled the jar. Finally the candle was complete! Everything I did to make this candle was very unorthodox. 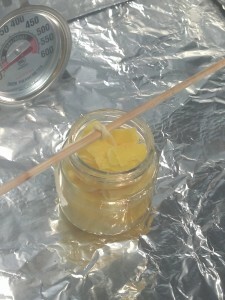 I haven’t heard of anyone making candles using a solar oven, or by simply filling the jar with wax. The traditional method is to melt the wax in a double boiler on an oven, and pour it into the container with the wick in place. Evaluating how my method worked, I would say it was effective, but continuing to fill the candle with wax was time consuming. Using the solar oven was great! It was very effective at melting the wax, and it was fast enough. I suspect the wax melted in a lot less than an hour. I think the process would take less of my time, though, if instead I simply melt a container of wax, and then pour it into the candle jars and put the wicks in place. This would be a bit more like the traditional candlemaking method. Another change I would make is something I learned from Candle Making in a weekend, which I reviewed here. Keeping the wick straight up and down was very difficult while filling it with wax. The book recommends pouring in about a 1/4 inch of liquid wax, and then pushing the wick tab down to the bottom using a small stick or skewer. Also, rather than tying the top of the wick to the skewer that rests on the top of the jar, the book recommended pulling the wick across the skewer, and taping it to the opposite side of the jar. With tying the wick, it was difficult to maintain enough tension for the wick to stay straight. I think this other method might do a better job of keeping the wick straight. I look forward to making more candles soon, and I’ll be posting how that goes!